Splash some color into your under the sea theme party by adding some of the Assorted Inflatable Tropical Fish! 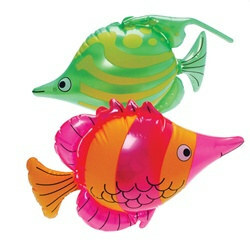 These Assorted Inflatable Tropical Fish are a must have for any luau, nautical, or under the sea party theme. Use the Assorted Inflatable Tropical Fish to hand out as favors to your party guests or as an added 3-dimensional decoration. Create a full under the sea life-like look by hanging some of the Assorted Inflatable Tropical Fish from the ceiling in front of the Undersea Backdrop. Each 16 inch Assorted Inflatable Tropical Fish is the perfect size and shape to drape from the ceiling in some of our Fish Netting for a marina style decoration. CHOKING HAZARD - Not for children under 3 years, can choke, or suffocate. Adult supervision required. Decorations for a cube at work for a 30th birthday celebration. Prices were very good, product is what I expected. We ordered two of these. One held up pretty good; the other must have had a slow leak.